How to obtain a personal Rav-Kav card? In order to obtain a personal Rav-Kav card, you need to come to one of the service points located at most major bus terminals, fill out a form and get photographed. 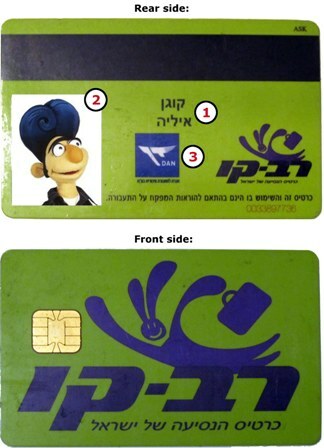 You will receive a Rav-Kav card on the spot for free. Kavim is the only company which allows to order a Rav-Kav card online. Discount certificate for a senior citizen, student etc. These service points are open on Sunday-Thursday between 8:00-18:00 and on Friday between 8:00-13:00. On the Kavim website you can fill out an online form (Hebrew) and get the Rav-Kav card mailed to your home. Note that for service regarding the card you'll still need to come to one of the service points (Hebrew) in Petah Tikva, Afula, Kiryat Ono or Kafr Qasim. These service points are open on Sunday-Thursday between 7:00-19:00 and on Friday between 7:00-13:00. Note that travel on the Jerusalem light rail is free during the first months of operation. Therefore you cannot (and don't need to) load light rail tickets or passes onto the card. But you can get your card from CityPass and use it for buses. Service points of most other companies are located on central bus stations of the areas they serve. Information in Hebrew can be found on their websites. What if I care about my privacy? Instead of a personal Rav-Kav card, you can purchase an anonymous Rav-Kav card from a bus driver. It allows some of the benefits of a personal card, but does not require identification.